Dubai has so often come to be associated with glitz and glamour and everything luxurious that there’s a saying these days “You name it, Dubai has it. Or if it doesn’t have it, it’s building it.” It is a city that rose from the desert and made its way to everybody’s bucket list. It’s a city of dreams; of dazzling modern architecture. So if you think money can’t buy happiness: Habibi book a flight and come to Dubai. The major airport of this bustling city is Dubai International Airport with IATA code of DXB. This airport connects the heart of Dubai to other emirates and major cities across the world. If you are looking to fly in or fly out of Dubai, Rehlat has a long list of flight options available. Rehlat has flights to Dubai at highly discounted fares. Go on be a part of the celebration that is Dubai. The Southern Runway at Dubai International Airport (DXB) would be closed from 16 April to 30 May 2019. Plan your arrival at the airport early (at least 2 hours before for domestic flights & 3 hours before for international flights), and build in enough time to check in, pass through immigration and get to the appropriate gates. The city of Dubai in the United Arab Emirates (UAE) features some of the iconic sights, top ranked restaurants, vibrant nightlife and several adventure activities for kids and adults. Visitors can stay in true ‘Arabian style’ area around the Burj Khalifa, take a stroll around the lake and try yummy local food at the Al Manzil Courtyard restaurant or just unwind your senses on the glittering beaches. Alternatively, one can also visit the historic Bastakiya’s wind-towers. Dubai’s incredible malls offer more than just shopping. With some 96 malls across the city, there’s no better place to find that perfect dress, elegantly tailored suit or quirky memento. The best shopping malls in Dubai are: The Dubai Mall, City Walk, The Outlet Village, Mall of the Emirates, Mercato Mall, Ibn Battuta Mall, WAFI Mall and to name a few. When it comes to food, the vibrant city Dubai is almost too exotic to imagine. There are several restaurants serving virtually every national cuisine from around the world, including many specializing in Dubai’s own Arabic delights. One can choose from a glittering array of celebrity restaurants and a huge variety of Middle Eastern food. Famous restaurants include: COYA Dubai, Indego by Vineet, La Petite Maison, Nobu Tong Thai. 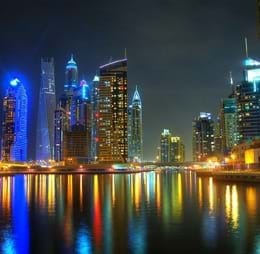 Dubai is also popular for its vibrant nightlife and it has much to offer of late night entertainment and the emirate regularly hosts some of the world-renowned DJs, most popular club nights and artists from around the globe including David Guetta, Martin Garrix, Katy Perry, Nicky Minaj, Chris Brown and more. Cars, buses, Tram cars, Metro rail, high-speed rails, and waterways are the major transportation facilities of the city. Taxi services are easily available at affordable prices. Water buses and water taxis are mostly available on selected routes. Dubai flights arrive at the Dubai International Airport (DXB), which operates both domestic and international flights. This is the second largest airport in the world which has 3 terminals and consists of 75 million passengers capacity yearly. Dubai airport is spread over 7,200 acres of land and consists of four terminal buildings and four concourses. A popular way to get around Dubai is Taxis, which are efficient, metered and reasonably-priced, with well-trained and courteous drivers. A clean, air-conditioned and modern system directly linked to Dubai International. Transport doesn’t get much easier than the Dubai Metro! Buses are a low-cost option, mainly suited to residents or people familiar with the city, as the network is extensive. Dubai boasts of several budget hotels and has many state-of-the-art 5-star luxury hotels that offer an engaging environment and exceptional culinary experiences to their guests. Apart from a host of contemporary amenities like fitness centers, Wi-Fi, bed and breakfast benefits, most of the Dubai Hotels have world-class hospitality combined with scenic outside views to delight the guests. Are you planning to book flights to Dubai? Dubai is a beautiful destination that holds surprise retreats at every corner. People who dream of exploring the world may fall short when it comes to expensive flight fares. But obtaining budget flight fares to Dubai is not a myth anymore. Keeping your monetary constraints in mind, we at Rehlat offer low-cost flight bookings using our exclusive offers on flights. Exploring the world doesn’t mean to burn a hole in your pocket. If you are looking for best flight fares to Dubai then you’ve landed on the ideal place. You can select Dubai flights operated by a range of renowned airlines and book swiftly without any hassles. Above all, you can take advantage of our year-round flight offers and attractive cashback offers and complete your journey within budget. Besides Dubai flight bookings, you can obtain hotel reservation from a range of hotels in Dubai with us. If you’re flexible with travel dates, you can book your Dubai flights well in advance at budget-friendly prices. There are hundreds of Dubai flights available from across the world. You just have to select the travel dates and departing destination, and there you are! You are ready to choose from a huge selection of all possible flight options to fly to Dubai. Select from a range of deals and make sure you don’t stick for the very first deal on the list. Take your time to check what every deal is offering and select appropriate Dubai flight deal that is worth paying for.